The Newport Tower is a small stone tower in Newport, Rhode Island, standing on the highest point in the city, overlooking Newport harbour in what is now Touro Park. 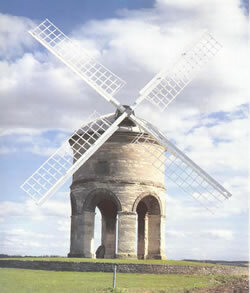 It is a small circular structure on eight thick circular columns, about 7 m in outer diameter and 8 m high. It is constructed of very uneven field rubble stones set in mortar. Originally the entire building was covered with a thick coat of plaster. Most of this coating has peeled, but fragments and patches of it remain here and there. It probably had a domed roof, but nothing is left of it. 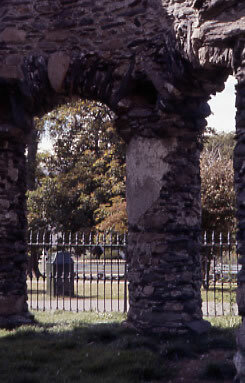 The columns are connected with each other via flattened arches. The irregular stone building material gives the arches a somewhat haphazard appearance. Below ground the columns rest on piles of rock and soil in a circular construction trench. 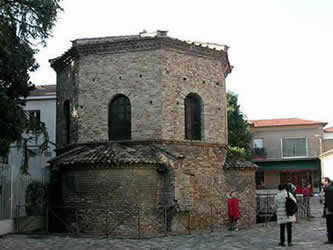 When it was built, the tower stood two stories above the columns, connected by a stairway. The floor and stairway were anchored on square wooden beams, about 30 cm thick, set into niches in the walls. A low doorway led into the tower on the first floor. Near the door was a fireplace set into the wall. Newport was founded in 1639 by the Englishman William Coddington. The tower is first mentioned in a deed of 28 February 1677 and later on in the 24 December 1677 will of Benedict Arnold, governor of the colony, who had lived in Newport since 1657 and who was one of the richest men there. The controversy over the origin of the tower began when Carl Christian Rafn was working on his publication on the Vinland sagas. 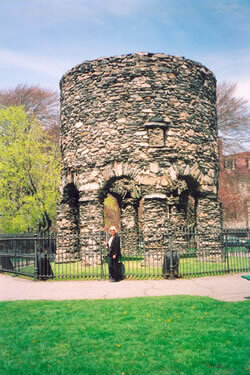 Responding to an inquiry from Rafn about possible Norse antiquities in North America, Thomas Webb, the secretary for the Rhode Island Historical Society, told him about the Newport Tower. 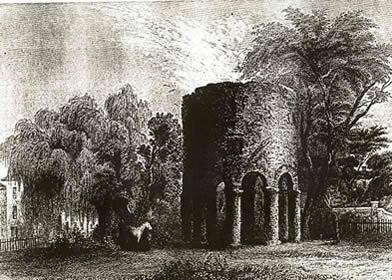 In a letter of 22 May 1839 Webb also sent Rafn a drawing of the tower. Rafn promptly concluded that the tower was a Norse round church built by a party of Norsemen under the leadership of Bishop Erik Gnupsson who had gone to discover Vinland in 1121. Rafn’s theory was published in a supplement to Antiquitates Americanae in 1839 and again in 1841. Inspired by this and the finding of a grave believed to be that of a Norseman at nearby Fall River, Massachusetts, the American poet Henry Wadsworth Longfellow wrote his widely read poem "The Skeleton in Armor". 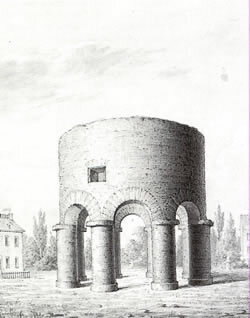 Rafn’s view of the tower was supported in a popular series of lectures and articles by Asahel Davis. A debate began, which continues today. Some say that the tower was built in the mid-17th century by Benedict Arnold, and that its architecture is typical of Newport and Rhode Island. Others maintain that the architecture is medieval and therefore must predate the 17th century. Excavations in the 1940s and 1950s did not settle the matter. What do you think? 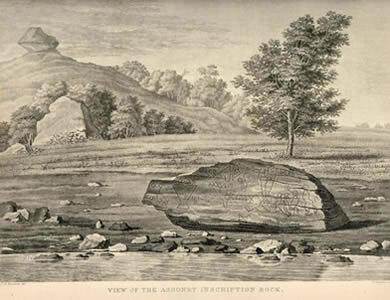 The Dighton Rock is a glacial boulder of greywacke. 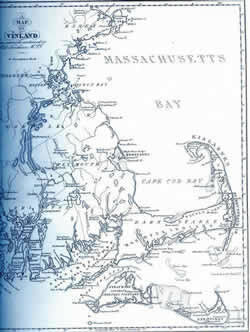 Originally located on the eastern shore of Taunton River near Dighton, Massachusetts, and protected by a coffer dam in Dighton Rock State Park. Dighton is near the town of Berkley, Massachusetts near the border between Massachusetts and Rhode Island. The rock, which is about 3.5 m long and 1.5 m high, has a slanted surface covered by figures and lines. It has been studied for over two hundred years. 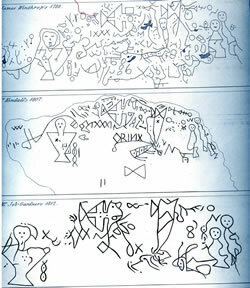 Originally the images were believed to be Phoenician. Carl Christian Rafn thought that at least some of its symbols were a pictorial representation of Thorfinn Karlsefni’s colony, with Gudrid and baby Snorri on the shore while being attacked by native people. He also suggested that it contained a runic inscription saying ‘Thorfinn and 131 [possibly 151] men took possession of the land.’ Others have suggested that it was carved by the Portuguese explorer Miguel Cortereal. Others again think that it is an Aboriginal petroglyph. What do you think is the most reasonable explanation? Is it a runic carving left by the Norse in Vinland?